Use a chunky yarn (I used 12 ply wool which is very soft and un-prickly) and a 6mm hook, this makes a quick and warm hat which can be customized in any number of ways. 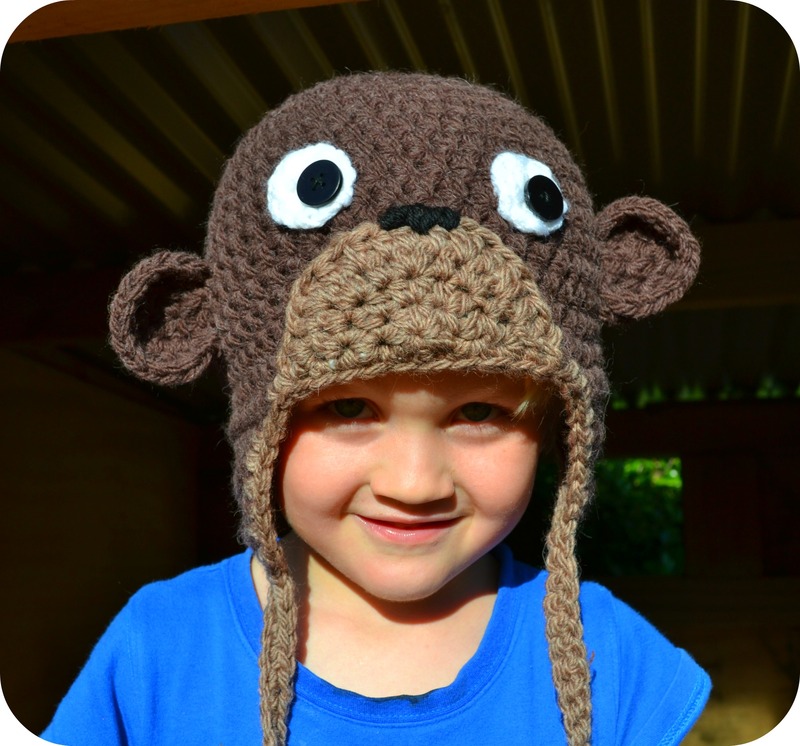 This is the third year I have made this hat for Carter – but the first time its looked like a monkey! Ive also made the same hat for Maia, so its gender neutral. You could make this hat in a lighter yarn, but you will need to make more rounds at the beginning- just follow the pattern outlined below and continue until the hat is the right size. 12 ply yarn in dark brown, lighter brown, white and a small amount of black. Round 1: Make a magic circle and chain 2, half double crochet (HDC) 7 x into the circle and pull tight, join to top of chain 2 (8). Round 2: Chain 2 (counts as first HDC here and throughout), HDC into same stitch, 2 HDC into every stitch around, join to top of chain 2 (16). Round 3: Chain 2, 2HDC into next stitch. 1HDC into next stitch, 2HDC into next stitch around, join to top of chain 2 (24). Round 4: Chain2, HDC in next stitch, 2HDC in next, *HDC in next 2 stitches, 2HD in next stitch*, repeat between * and * around, join to top of chain 2 (32). Round 5: Chain2, HDC in next two stitches, 2HDC in next, *HDC in next 3 stitches, 2HD in next stitch*, repeat between * and * around, join to top of chain 2 (38). Round 6: Chain2, HDC in next three stitches, 2HDC in next, *HDC in next 4 stitches, 2HD in next stitch*, repeat between * and * around, join to top of chain 2 (44). Check the hat for size- it should be ALMOST as big as the head- no bigger. If you need to add another round following the same pattern. Obviously if you are making a smaller hat you will need to make it a round or two smaller. Round 7 – 16 Chain 2, and then HDC into each stitch around, joining each round as you go. At this point you want to make the hat as long as it needs to be – remembering there will be one more row around the entire hat which will add a little (about 1cm) length. Fasten off. Count 6 stitches from the centre back (where you just fastened off) and join your yarn onto the hat. 1. Chain 2, HDC in next 10 stitches, chain 2 turn. 2. HDC 2 together, HDC 5, HDC 2 together, chain 2 turn. 3. HDC 2 together, HDC 4, HDC 2 together, chain 2 turn. 4. HDC 2 together, HDC 3, HDC 2 together, chain 2 turn. 5. HDC 2 together, HDC 2, HDC 2 together, chain 2 turn. 6. HDC 2 together, HDC 2 together, fasten off. Count 12 stitches around front of hat, join yarn and repeat for ear flap 2. 1. Make a magic circle and chain 2, 6 HDC into the circle- pull tight and join. 2. Chain 2, HDC into the same stitch, 2 HDC into next 4 stitches, DO NOT JOIN, chain 2, turn. 3. HDC into same stitch, *HDC into next stitch, 2HDC into next stitch* repeat between * and * 4 times, DO NOT JOIN, fasten off. Leave long end to sew onto hat with. 1. Make a magic circle, chain 2 and 6 HDC into the circle, pull tight and join into the top of chain 2. 3. HDC into same stitch, *HDC into next stitch, 2HDC into next stitch* repeat between * and * 4 times, DO NOT JOIN, chain 2, turn. 4. HDC into same stitch, *HDC into next stitch, 2HDC into next stitch* repeat between * and * 6 times, DO NOT JOIN, fasten off leaving long end to sew onto hat. Make a magic circle and chain 2, 9 HDC into the circle, pull tight and join to top of chain 2. Fasten off leaving a long end. Sew muzzle onto front centre of hat around the curved edge only. Join contrasting colour to center back, chain 1 and single crochet around to center of first flap. Chain 31, sc in second chain from hook and in each stitch back along chain to flap, then in each stitch around front of hat (working to catch hat and muzzle together as you sc along front) to center of next ear flap. Chain 31, sc in second chain from hook and in each stitch back along chain to flap, then in each stitch around to center back of hat, join to starting chain and fasten off. Position and sew eyes in place, and sew a black button into center of each. Fold ear of edge over and sew each one in place (see photo for help). Embroider nose using black yarn. Sew in all ends and that’s it you’ve finished a very cheeky little monkey hat!!! Cutest little face ever! Adorable hat too : ) Thank you for generously sharing the pattern! How generous of you to share your pattern, now I just have to find someone to make it for! Thank you so much for the pattern. I know a couple of cheeky little grandsons who will have these next winter. So glad Carter had a grand birthday. 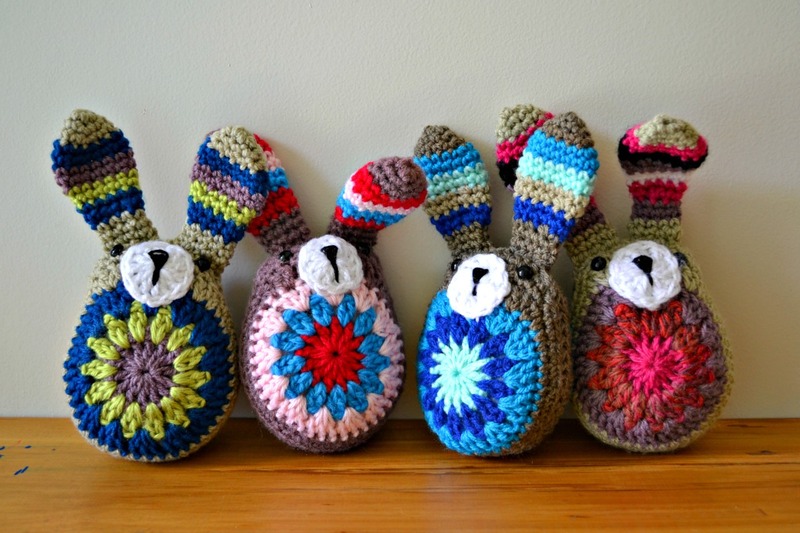 He makes a terrific reason for crocheting with a smile! Thank you so much for sharing the pattern. It is way too cute!! I have been looking for something just like this. Many thanks for sharing the pattern. I think that my 2 year old Grandson will have a great time wearing the “monkey hat”. I intend to make it for him and will get his size when we visit. I have been looking for a crocheted monkey hat. My grand nephew is now 5 months old and weighs around 20 lbs. He is our Chubba Bubba and his mom calls him “her monkey boy”. I want to make this as a Christmas present. Too Cute!! Thanks for sharing pattern. I’d like to make for my grandson but I’ve never heard of a magic circle. Please let me know what it is. Here’s a quick tutorial. If you cant manage it just chain 5 and join with the ss to start. 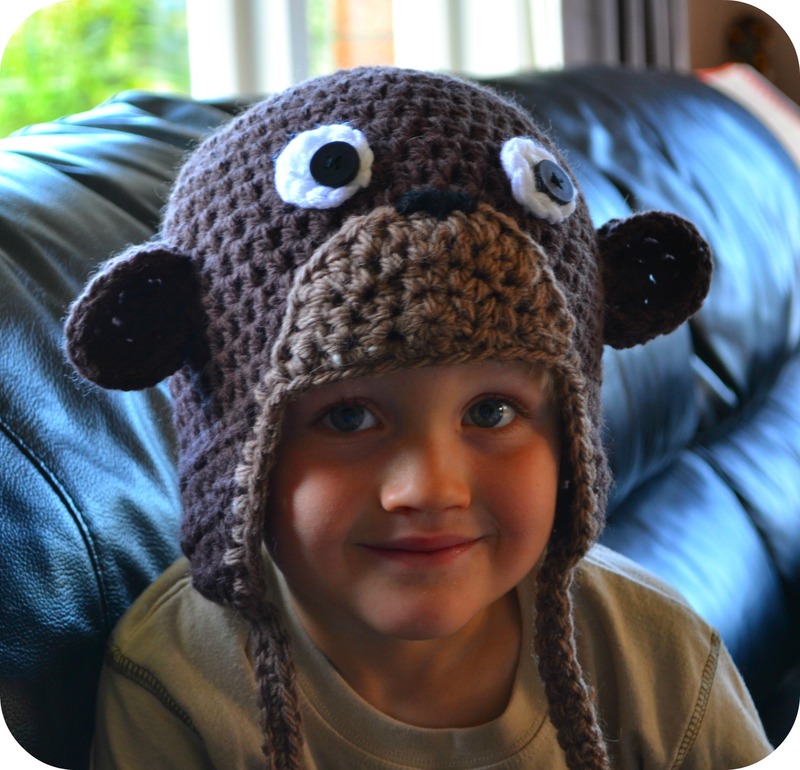 my son was looking for a monkey hat for me to crochet him. i searched images and he chose yours! it’s adorable. thank you so much for generously sharing this pattern. my son and i appreciate it very much. have an awesome day! So glad you liked it… thanks for your lovely comments!!! Where do you find 12ply yarn. I’m new to crocheting and have looked all over for the correct thickness yarn. I couldn’t find it so instead am using three strands of regular yarn to try to work with your pattern. The result is a cute hat so far but a bit stiff. Any help or suggestion would be greatly appreciated. Thanks!! Are you working in one direction and then back the other way- not in rounds? Ive had a look and it should be in the next stitch- which means you end up with 11. Sorry about the confusion!! This hat is precious! I am making them for my grandchildren who are 1, 3, and 5 years old. I’m not sure how tall to make the hats. I looked online and most say 7.5-8.5 inches tall, but to subtract a little if it has earflaps. I am not able to have them try the hats on because they live far away. How tall do you think I should make each one? Its really tough to say because every child has a different sized head! 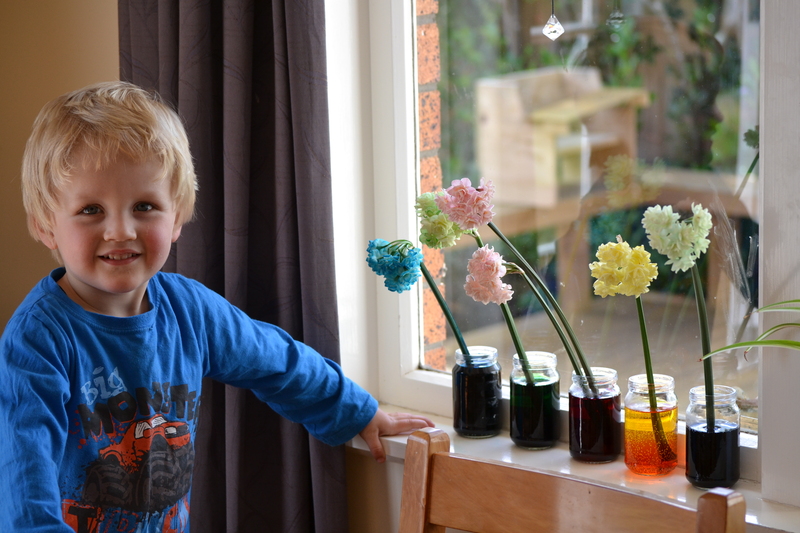 I always just try the kids ones on my own head… and make it ever so slightly shorter – seems to work ok! Ive had a look online it seems about 8 inches for 1 year, 9 inches for toddler and almost 10 (about 9.75) inches for child. Super cute and fun for a child to wear! I am going to crochet little teeth and turn it in to a beaver hat!